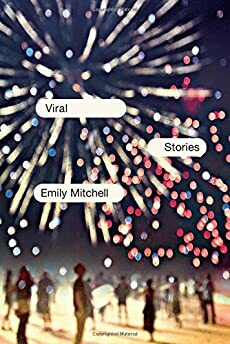 Largehearted Boy: Book Notes - Emily Mitchell "Viral"
Book Notes - Emily Mitchell "Viral"
"A rich collection that takes the familiar obsessions of love and loneliness and views them from uncanny angles in ways that are magical, cutting, and intensely recognizable." Viral: Stories is a collection of short stories about the many different ways there are to be a stranger: to a place, to those around you and to yourself. I didn't set out to deliberately build the collection around this theme. The stories in the book are different from one another in many ways. Some are historical fiction, some are speculative fiction. Some are realistic and some are surreal. I wanted to push the short story into as many different shapes as I could find for it. But when I looked at the stories I had written all together, this concern with the experience of estrangement is the current that runs through them. This comes partly from my experience. I've moved around a lot. I immigrated to the US as a teenager and migrated a lot subsequently, so I've never felt a deep bond to one particular locality. For a writer this presents an interesting problem since no place, people or vernacular are fully your own. Of course, I'm far from being alone in this experience either as a human being or as a writer; if anything, the transience of people's lives is increasing. The result for me has been a desire to write stories that express how this feels, to be a person who is never fully at home; to have been to lots of places but have no deep, native knowledge of anywhere; to have friendships and love affairs that are mediated by phone calls, emails and social media. The characters in my stories want to understand and love, but they find themselves stymied by distance and uncertainty, by the apparent unreliability of even their most intimate places and relationships. Music, I think, can intensify both of these tendencies. It can create a sense of belonging, and it can also just as easily give us a sense of separateness, of being transported. Some of these songs were directly influential on the stories; others resonate with the emotions I want the stories to convey. Like the stories in Viral: Stories, they appear to be a mismatched bunch, but there are certain underlying threads that connect them. These two songs are definitely keynotes for collection as a whole, especially "Deeper Understanding". Released in 1988 on The Sensual World, it contains these eerily prescient lyrics: As the people here grow colder/I turn to my computer/and spend my evenings with it like a friend. Has there been a clearer expression of our fears about how technology might replace human intimacy? Kate Bush seems to grasp both the allure of technology and the dangers of our attachment to it. In the title story of my collection, a group of bereaved parents gather at a hotel after some initially unnamed tragedy has struck their children. As the story goes on, we discover that social media has played a role in what occurred and must ask, along with the characters, was it the cause of the disaster? And if it wasn't technology that brought about the tragedy, what was it? In several of my stories – "Smile Report", "My Daughter and Her Spider" – I tried to capture the conflicted sense of possibility and anxiety we have about how technology might affect and change us in the years to come. I love Big Star's music. Listening to them, you always have the sense that Alex Chilton's lyrics mean exactly what they say and exactly the opposite of what they say at the same time. This song seems to be a straightforward tribute to friendship: Thank you, friends/Wouldn't be here if it wasn't for you/ I'm so grateful/ For all the things you helped me do. But it absolutely omits any context. Where is the person singing these words? What exactly has he been helped to do? You are never told, so the possibility of a different interpretation sneaks in where what he really means is "Thanks for nothing!" In my collection, the story "On Friendship", explores some of the ambivalent, oscillating feelings that we can have about our friends, the way that friendships can be lost through distance, misunderstanding and failures of generosity, but also the ways they can, sometimes, if we are very lucky, be found again after many years. I wrote the story "Lucille's House" after visiting the Louis Armstrong House Museum in Corona, Queens, a place I loved and found extremely moving. After Lucille Armstrong purchased this house in 1943, she and Louis lived there for the rest of their lives. When you walk through its rooms, you can tell it was truly someone's home. Of all the stories in the collection, this is the most clearly indebted to music and I had a tough time choosing one song by Armstrong to signify that connection. Armstrong's music has such height and depth; each song seems to contain the greatest joy and the deepest sadness. I chose "Long, Long Journey" because, like the story, it is about how enduring and complicated love can be and how much we need it to sustain us. Really, I have no idea what David Bowie is on about in the lyrics of this song which is on Hunky Dory, a generally pretty inscrutable album. However, in the guise of a rousing knees-up, this song seems to be about the transition to a post-human world where the change has come so abruptly that parents don't have any idea what to make of their own children. However, instead of being horrified, the song urges the listener to embrace the strange new world it envisions. In my collection, "My Daughter and her Spider" is a story told by a mother whose daughter chooses a giant, robotic spider for a pet, a choice that makes the mother feel she has no idea who her own daughter has become. But perhaps the problem is not with the daughter, but in the mother's unwillingness to accept her for who she is, giant robot spider and all. Our built landscape in the US is composed of non-places. It is designed to be traveled through easily but it contains very few real destinations when you compare it to many other countries. This song brilliantly articulates that quality, which makes American locations dynamic and haunted by what was there before and also by what is to come. Anderson deadpans: [J]ust take a right where they're going to build that new shopping mall, go straight past where they're going to put in the freeway, take a left at what's going to be the new sports center, and keep going until you hit the place where they're thinking of building that drive-in bank. You can't miss it. In the story "States", which is told in the form of a fantastical guidebook for foreign travelers, I wanted partly convey the strange sensation of moving through the American landscape, and also to work against its homogenization by populating it with stories that would re-enchant it, differentiate it, bring it back to life. "It's the End of the World as We Know It" by R. E. M.
Several of the stories in this collection are about bewilderment. In "Guided Meditation" a meditation teacher loses her veneer of calm, goes off script and starts haranguing her students, telling them what she really thinks. In "If You Cannot Go to Sleep" a woman whose marriage has recently ended, lies awake all night with thoughts spinning in her head on every topic from supermarket check-out clerks to global warming. This song has the same manic, trapped energy as some of my narrators and characters, which I think could be a reaction to the bewildering overload of disjointed information that we encounter in our daily lives now, like it or not. The refrain of this song (I fell into your alien arms/I've never felt so good, so lost) suggests the connection between falling in love and losing your bearings. Even if we love and live with someone for years, aspects of them will always remain mysterious and, more interestingly, love requires and thrives off this mystery for its renewal, even while being threatened by it. The story "Three Marriages" traces the arc of three couples who find out things about each other that have the potential to demolish their relationships, and then follows them to find out what happens as a result of their respective discoveries. In "No-no" – a story set during World War Two, one of the collection's two pieces of historical fiction – a Japanese American man tries to decide whether to sign a loyalty questionnaire that might allow him to leave the internment camp where he and his family are being held. Like a lot of idealistic people of his generation, this character is a Communist. He has certain optimistic ideas about America's potential to realize a truly egalitarian society, which have been battered by how his government has turned on him for his ethnicity. Billy Bragg's song is about the difficulty of maintaining a belief in the potential for justice in a world that seems determined to erode and undermine it.